Picking up and down-ending truck bed liners weighing 270lbs is a time consuming operation requiring at least 2 operators be exposed to back injury. 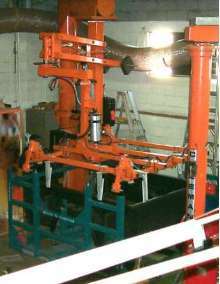 Coleman Manipulator with powered up-ending clamp attachment mounted on an overhead bridge system. Utilizing single operator control, upending an awkward 270lb item is done with the press of a button. Labor savings - One operator can do what required 2 operators in the past. Injury exposure reduced - The machine does all the back-breaking lifting and frees the operator to focus on positioning the item, instead of using brute strength to muscle it into place.